Between 2016 – 2018, Stena RoRo placed orders for eight Stena E-Flexer class vessels with the Chinese AVIC Weihai Shipyard. 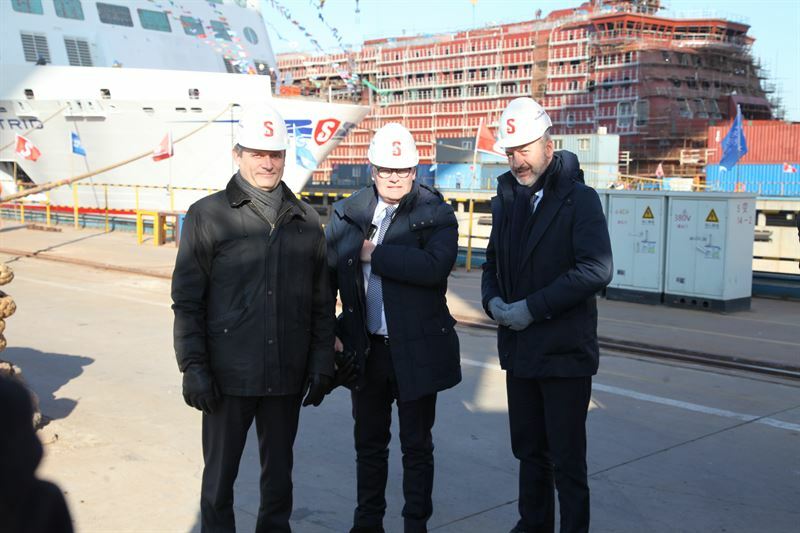 Construction is continuing according to plan and yesterday, 16 January, two ceremonies took place in the shipyard – the launching of the first E-Flexer and the keel laying of the third vessel in the series. Guests from near and far gathered in a chilly but sunny Weihai in order to witness these solemn ceremonies. 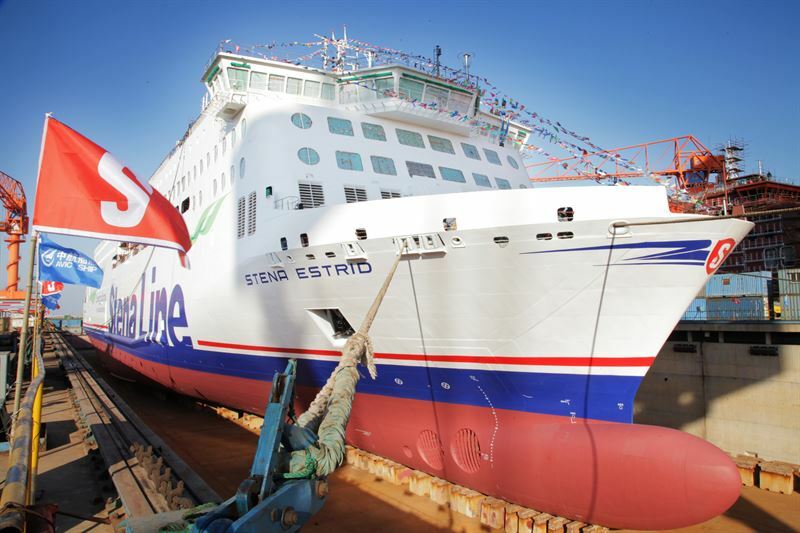 The first E-Flexer, named Stena Estrid, was launched yesterday. L to R: Per Westling, CEO of Stena RoRo, Niclas Mårtensson, CEO of Stena Line, Christophe Mathieu, CEO of Brittany Ferries. Stena Line will operate a total of five E-Flexer vessels, two of which are an extended design. The first vessel – now launched – will serve the route between Holyhead and Dublin, while the other two will be running the line between Belfast and Liverpool. A 10 year charter contract has been signed with Brittany Ferries for two vessels, the first of which was keel laid yesterday. Both will complement the company’s current fleet of freight and passenger vessels, travelling between Portsmouth in the UK and Bilbao and Santander in Spain. DFDS has also signed a 10 year charter contract for one E-Flexer, to be used to travel across the English Channel. Four of the eight vessels now ordered are under construction together and the ceremonies, which took place yesterday, are both key milestones in the process. Keel laying is the starting point for the construction phase where the hull and exterior sections are put in place. Traditionally, keel laying involves placing a newly-minted coin under the keel to bring luck and success in all the ship’s future sailings. 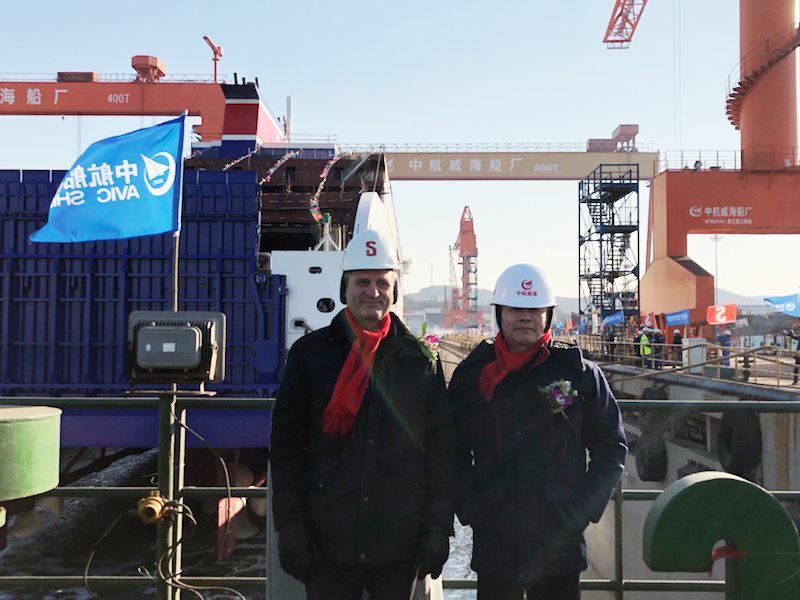 L to R: Per Westling, CEO of Stena RoRo and Sun Yan, Chairman of Avicship. In 2016, Stena RoRo placed an order for four RoPax vessels with the option – now utilized – to increase by a further four vessels. The E-Flexer models, expanding on Stena Line’s successful business model of combining freight and passengers, will be 50% larger in the basic model than the current RoPax model standard ferries. These vessels will be at the forefront in terms of sustainability and will create a new standard for emissions, cost and energy efficiency, as well as performance.